All pictures and text on this site are copyrighted ©1982-2019 Alex Peck. All rights reserved. 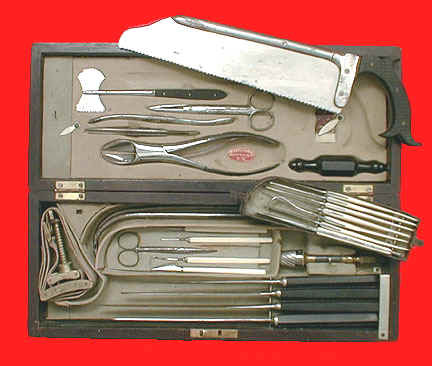 A fine Civil War-date general operating set as designed by James R. Wood, M.D. (1813-1882), in conjunction with the firm Wade & Ford (fl. 1860-1866), New York. For a discussion of this collaboration, see Edmonson, pp. 80-81. The brass cartouche on the lid is engraved: J.H. Culver / 1863. Josiah Howell Culver, M.D. 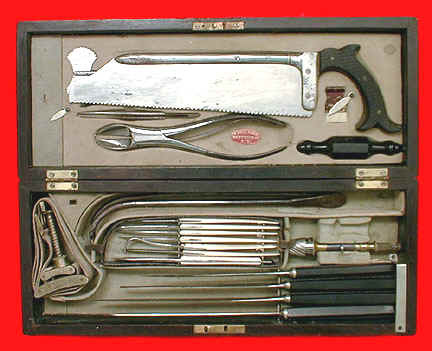 (1837-1868), an 1860 graduate of the Medical University of the City of New York, was commissioned a United States Navy assistant surgeon in March of 1863, and he served in the Navy beyond the Civil War until 1867. 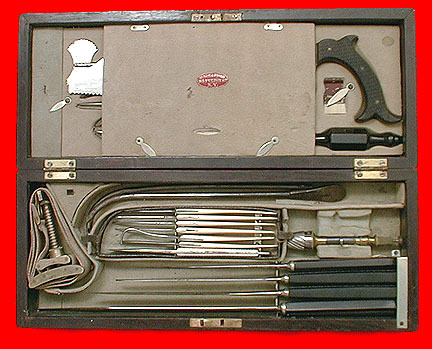 Dr. Culver may have gotten the surgical set at the time of his commission. Click any image to make it larger.